AMD demonstrated the world's first 7nm GPU architecture at Computex 2018. 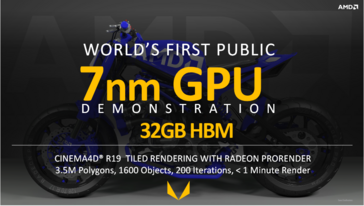 The Radeon Instinct series of accelerators are made for High Performance Compute (HPC) applications and feature 32 GB HBM2 memory on a 4096-bit bus. The 7nm Vega GPUs are currently being sampled with targeted availability in 2H 2018. AMD took to the stage at Computex 2018 and showed off the world's first 7nm GPU based on the Vega architecture. The new GPU finds use in High Performance Computing (HPC) applications such as servers and workstations, and is specially designed for deep learning operations in Artificial Intelligence and Machine Learning. This is not the first time we're hearing about a 7nm Vega chip, though. Towards the end of April this year, there was information floating around that AMD would be sampling 7nm GPUs to select customers as soon as Q2 2018 with targeted availability sometime in Q4 2018. Looks like that information has turned out to be true. The 7nm Vega is based on the 5th generation GCN architecture based on the Vega 10. 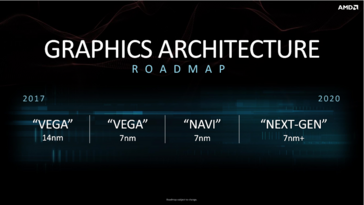 AMD did not specifically use the Vega 20 moniker in any of its slides today. 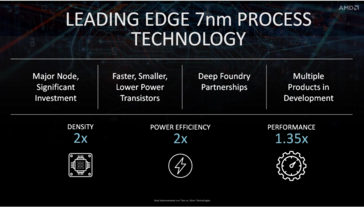 AMD also detailed some of the benefits of moving to the 7nm process, which will find implementation in the company's GPU roadmap till at least 2020. The prototype 7nm Vega Radeon Instinct accelerator card sports 32 GB of HBM2 memory. While AMD did not divulge the specs of the card, from what we know so far, the card could feature a 4096-bit bus. The launch timelines for the new Radeon Instinct accelerator cards are pretty aggressive. AMD has started to sample these cards with select customers already and looks to make them available for production by 2H 2018. 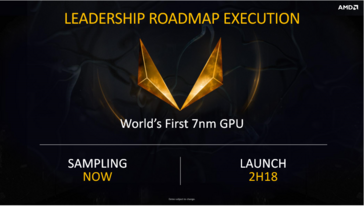 The benefits of the 7nm process will soon be translated into the consumer gaming segment with the release of 'Navi' scheduled to be sometime in 2019.